An Encore release of Jerry Goldsmith’s 1984 score for Runaway (1984). 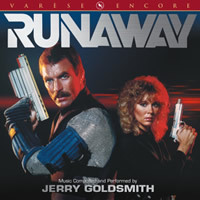 Runaway was one of only three all electronic scores by Goldsmith (the others were Criminal Law and Alien Nation). Of the three, however, Runaway was the most “symphonic”. The layers and textures which Goldsmith incorporated into the score, (which he performed himself), contained all the hallmarks of his compositional style. Runaway is very much a score orchestrated for synthesizers. The film was written and directed by Michael Crichton and starred Tom Selleck, Cynthia Rhodes and Gene Simmons in a futuristic story of technology run amok. For this special Deluxe Edition of the score we have rounded out its running time with a number of never before released cues and remastered everything from the original master tapes to make it sound better than ever. This Encore release makes our release from 2006 available for those who may have missed it. Jerry Goldsmith’s Runaway is back!